Using three ultra-modern, high-speed ferries to operate its routes, named Speedrunner II, III and IV, each vessel can carry up to 170 cars and 800 passengers. 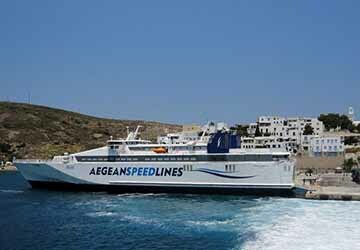 Furthermore, every one of Aegean Speed Lines’ ferries meets the high levels of comfort, quality and safety required for maritime passenger services, ensuring great value for money and an enjoyable journey. Just five years on from its inception in December 2009, the company was awarded the "best shipping company of the year" accolade by Lloyd's List for its commitment and dedication to providing high-quality services. This is primarily owed to the Aegean Lines staff and crew members who think and act as passengers themselves, allowing them to offer excellent customer service on a daily basis, and to continually exceed your expectations.